Note: Wheater Wednesday is a result of a massive blind wheated bourbon tasting that recently concluded. All bourbons rated here are publicly available. Old Weller is an iconic wheated whiskey brand from Buffalo Trace. It claims to be the first bourbon to use wheat in its mash bill, which may very well be true. 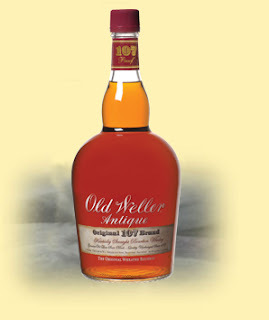 Old Weller Antique is bottled at 107 proof and carries no age statement. Nose: Vanilla and caramel with some corn notes. Pleasing maple sweetness--a very nice nose. Taste: Starts and ends sweet. This is obviously a wheater. Maple, vanilla, corn, maple syrup. Is consistent with the nose. Finish: Sweet and lingering in a jolly rancher sort of war. Overall: 89. The thing that held this one back from a 90+ score is the sticky sweetness of the finish. But an otherwise very fine bourbon.